Google Sites is a Google web application that allows users to create wikis and websites, with ease of use and collaborative design. 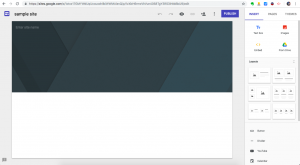 Google Sites is free to use (with a paid option that offers more storage capability) and is included in the G-Suite for Business and Education list of tools. 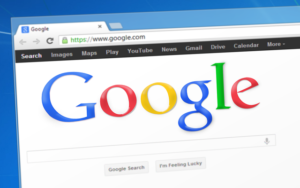 If you’re looking for a simple drag-and-drop web design tool for developing class websites, student project sites, or encouraging students to show their knowledge in different ways, check out Google Sites. Modification: Taking information from a more traditional source, and using Google Sites to make the information more accessible to all students. Redefinition: Collaboratively designing a website in real-time with peers and professionals/experts around the world. Far too often, technology is used as a direct substitute for other low-tech tools (e.g., pencil and paper). While substitution has some benefits (e.g., students develop their technology skills and knowledge), we encourage you to think about how you might use Google Sites to modify or redefine learning. Math: Students can create a math-based educational website. Examples being a tutorial for a certain math process, an overview of a branch of mathematics, or maybe an interactive biographical site about a given mathematician. Science: Google Sites is a great tool for creating digital science labs that students can follow along with on their own. There are a number of great examples of science teachers that have created their own interactive lab sites. English/Language Arts: Online book reports, classroom discussion forums, and informative sites about literary movements are some possible uses of Google Sites for an ELA classroom. Other uses: More generally, any classroom teacher could use Google Sites to create a one-stop hub for their students. Homework reminders, important resources, syllabi, and discussion forums are just a few ways a teacher could utilize this tool to make their learning experience go beyond just the classroom. E-Portfolios: Google Sites can be used to to track a student’s learning or progression throughout their year or multiple years. Check out more info on E-Portfolios here. Here are some Google Sites with examples and tips from educators about using Google Sites — How Meta! Now the content creation is up to you. Pick a theme from the options listed, choose how you want your website to be laid out, and drag and drop buttons and modules from the sidebar. Coutinho, C. (2009). Using Blogs, Podcasts and Google Sites as Educational Tools in a Teacher Education Program. In T. Bastiaens, J. Dron & C. Xin (Eds. ), Proceedings of E-Learn 2009–World Conference on E-Learning in Corporate, Government, Healthcare, and Higher Education (pp. 2476-2484). Vancouver, Canada: Association for the Advancement of Computing in Education (AACE). Retrieved November 11, 2018 from https://www.learntechlib.org/primary/p/32834/.